Content by tag "Connie Han"
For the Sunday of the Women's March we played new releases by pianist Judy Night, flutist Magela Herrara, Judy Bisantz, Bob Levy and saxophonist Carol Sudhalter with birthday shout outs to Eartha Kitt, Irene Kral, Jose James, Cheryl Bentyne, Peter Eldridge, Sade, and Dolly Parton, among others. This Christmas Eve's broadcast included new releases by Allison Au, Camille Thurman and John Daversa Big Band, with a first look at some Grammy nominees, plus birthday shout outs to Edith Piaf, Bob Brookmeyer and Lil Green , among others. Happy November! Time to bundle up, run a Marathon, vote and enjoy the last weeks of Fall. In this broadcast, there are birthday celebrations for Roger Kellaway, Clifford Brown and singer Ethel Waters, among others. Also exciting new releases from pianists Myra Melford, Larry McDonough and bassist Alexander Claffy. Birthday shout-outs to George Gershwin (with a nod to Ann Ronnell and Kay Swift, women writers that he encouraged) and saxophonist/arranger Frank Foster, along with new releases to round out the month of September. Connie Han, dressed in skin-tight leather, tosses back her long and lustrous black hair, then walks like a prowling cat to the piano. She sits down, doesn't smile, looks darkly at the keyboard. She pauses then starts playing a percussive riff. Lights! The band emerges from the shadows and falls in behind her. 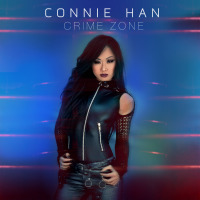 Twenty-two year old pianist Connie Han comes at you flashy, fast, and furious on her Mack Avenue debut Crime Zone. But it's flashy and fast with more than enough sense of history and creative curiosity to keep your ear pinned to whatever device you're listening on.